Today was a very long day for Camden, Mommy, and Daddy! I had a Level II Ultrasound this morning at 11am to find out if Camden is getting a baby brother or sister and to check the health of the baby!! After the ultrasound we had to wait almost two hours to have a video conference with someone in Atlanta who had to look over both Camden's and the baby's ultrasounds. The woman we had the video conference with said that she is going to talk to a genetic counsellor about figuring out why Camden never grew his limbs. She said most likely it was just a freak thing, since no one on either sides of mine or Camden's Dad's family have any limb deformities. So we will talk more about that in the future and I'm excited to see what we can find out!! 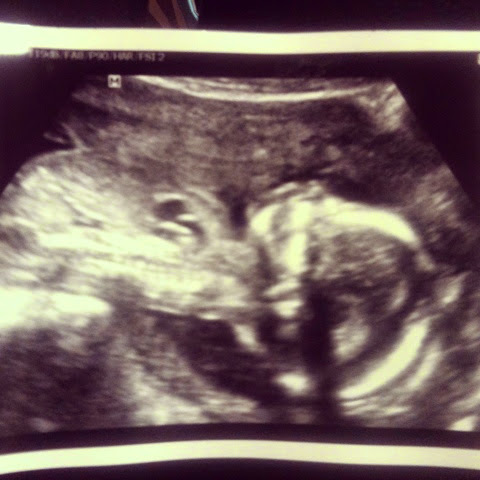 The woman said that my little peanut looks wonderful! Heart rate was 140 BPM and weighs 8 ounces! There are no abnormalities at all, that they could see. The only thing is that the baby's arms were measuring in the 10th and 15th percentile and the baby was hiding its face on my placenta just like big brother did, so she couldn't see the mouth or nose that well (checking for cleft lip or palate, I'm guessing) and they also couldn't see all the details of the heart, which was because of the position the baby was in! She said that the percentile for the arms are normal, but they are going to monitor the baby every 3-4 weeks to check on the growth and to get a better scan of all of the organs. I had some blood taken today to check for downs syndrome and Trisomy 18, and I think that will come back in a few weeks. I feel so blessed that God planned for my babies to be born so close together! They will be best friends, just like me and my brother that are 17 months apart, and I think that will be wonderful for Camden!! Congratulations Katie! I have followed your story as a fellow October 2013 mommy and can't wait to see the new chapter. 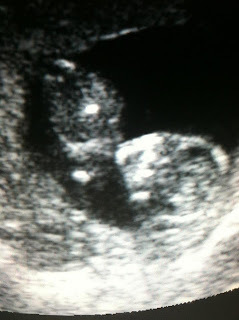 Our little girl is such a blessing, and I know yours will be too! Congratulations to big brother Camden! He is going to be the best big brother ever! Congrats! Girls are awesome! Again, please mention amniotic band syndrome, not a lot of people, even medical proffesionals, know much about it. It is NOT hereditary!!! Good luck and congrats! Congratulations! May God bless your pregnancy and your little girl. You are such a blessing to others and such a wonderful mother to Camden. I am so excited for you! I had a feeling you would have a girl! This is wonderful! Congrats. I am a fellow October 2013 BBC member as well and have followed you through your journey. You are a WONDERFUL mama. And Camden is the cutest little man! My oldest two are exactly 2 years apart and I had both of them by the time I was 20. I got to grow up with them. They are so close...even though the fight all the time like any brother and sister would do :-). I love her name too btw! I can't wait to see her pics when she is welcomed into the world!